Corn whiskey (sometimes called corn liquor or white lightning) is an American liquor made from a mash of at least 80 percent corn and distilled to a maximum strength of 160 proof (80% alcohol by volume). Distinct from the stereotypical American moonshine, corn whiskey uses a traditional mash process and is subject to the tax and identity laws for alcohol under federal law. Several commercial distillers such as Heaven Hill produce unaged corn whiskeys for retail sale. Unlike other American whiskey styles, corn whiskey needs no wood aging at all. If aged, it must be in uncharred or previously used oak barrels, and must be barreled at lower than 125 proof (62.5% abv); a whiskey distilled from a mash consisting of at least 80% corn in a charred new oak barrel would be considered bourbon. Aging usually is brief, six months or less, during which time the whiskey absorbs color and flavor from the barrel while the off-flavors and fusel alcohols are reduced. 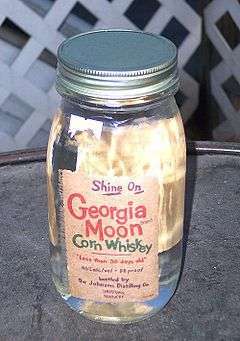 A variant called straight corn whiskey is also produced, in which the whiskey is stored in used or uncharred new oak containers for two years or more. 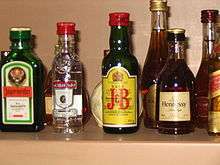 Whiskeys produced in this manner and aged for at least four years can be designated bottled in bond if they meet further requirements. The 1954 rhythm and blues song "Fat Back and Corn Liquor" was written by Louisiana songwriter Rudy Toombs and sung by Louis Jordan. It was released by Aladdin Records as the A-side of a ten-inch 78rpm record. ↑ http://www.law.cornell.edu/cfr/text/27/5.22 "Corn whisky" is whisky produced at not exceeding 160° proof from a fermented mash of not less than 80 percent corn grain, and if stored in oak containers stored at not more than 125° proof in used or uncharred new oak containers and not subjected in any manner to treatment with charred wood, and also includes mixtures of such whisky.